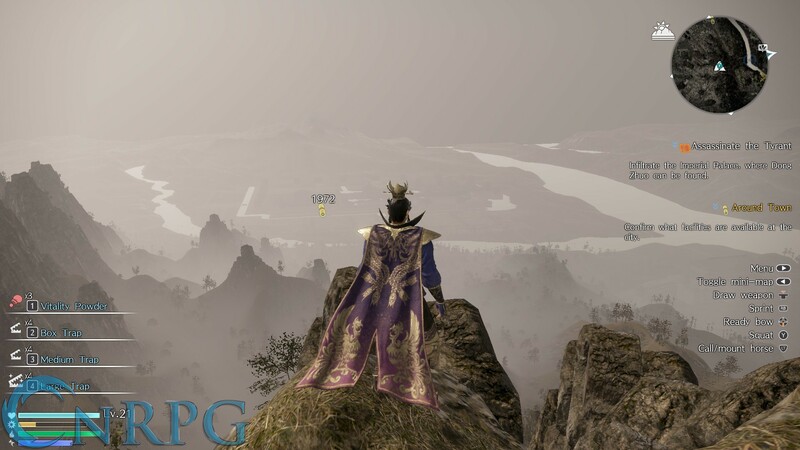 Dynasty Warriors has a long, 20 year history. Originally released as a fighting game in the Playstation Era, the franchise evolved with the release of the Playstation 2 into the hack-and-slash beat-’em-up many people grew to love. 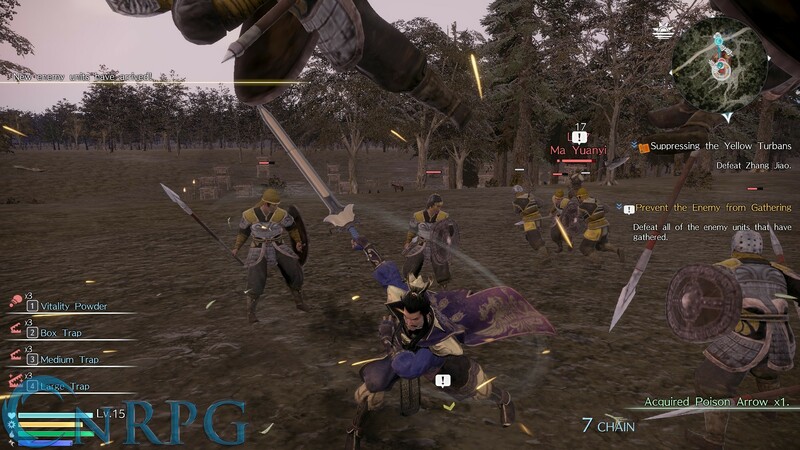 The ninth installment of the game has just launched, this time for the PS4, XBox One, and PC, and has drastically changed the way people have previously seen the franchise: Dynasty Warriors has gone open world. Gone are the small stages, replacing it with an even more grand one — all of ancient China. How does it fare against its predecessors, though? I was provided a copy of the title to try and tell you just that. But first, a little bit of knowledge about the franchise! Ancient China has a storied history. No, literally, there are several stories about ancient China, considered literary classics, no less. 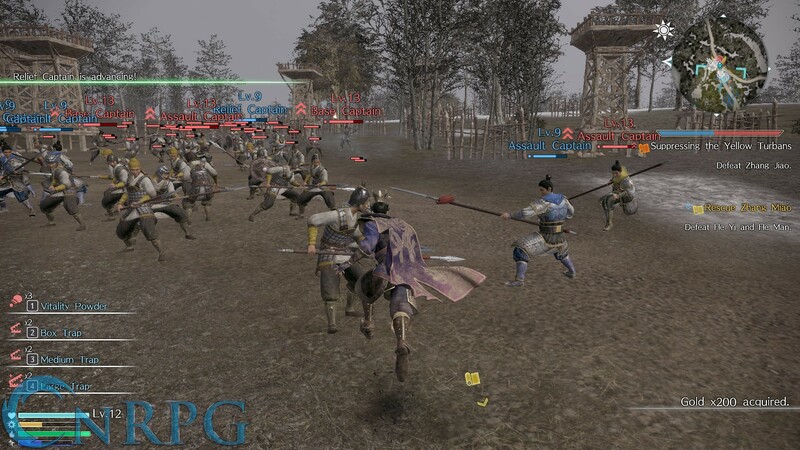 Romance of Three Kingdoms is one of them, and it’s the novel that the entire Dynasty Warriors franchise is based off of. Set in the fall of the Han Dynasty (206 BC – 220 AD), the novel by Luo Guanzhong is what most would be considered historical fiction. Dynasty Warriors is a lot like stepping back into time, only with tons more hack-and-slash and a lot less political intrigue. 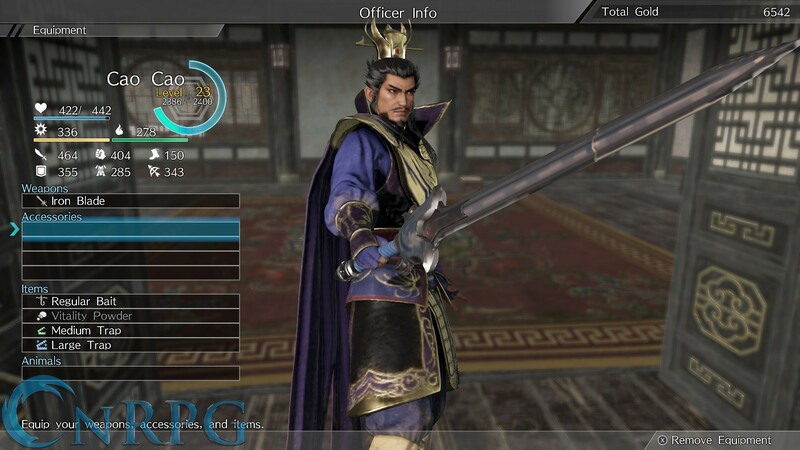 Dynasty Warriors 9 offers the greatest number of playable characters in the series to date: a whopping 90. Yet for the sheer amount of characters available, you start surprisingly humble, with a mere three. Arguably, these three characters are some of the most important in the history of the period, but it also gives you a good scope of how much time you’ll be spending on unlocking everyone. These 90 characters are spread across five different kingdoms — Shu, Wei, Wu, Jin, and the ubiquitous Others. Every character has their own weapon, and this is where a lot of the complaints will pour in: the movesets for each weapon type are the same, discounting a few key moves. Personally, this doesn’t bother me as much, given the grand scope of the game, but there are plenty of people out there where this decision is a deal breaker. That being said, I do feel every character is represented well and has their own uniqueness to bring to bear. 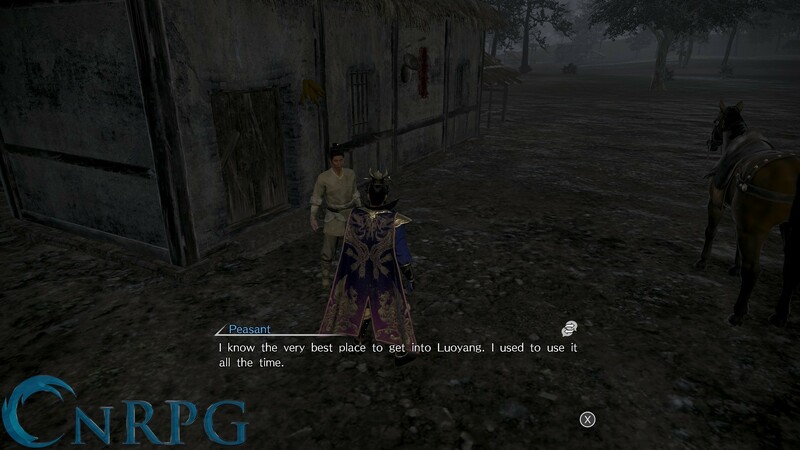 To be perfectly honest, Dynasty Warriors 9 does assume players to be relatively familiar with the franchise, but there is a tutorial in place when you first start a game that will teach you the basics. 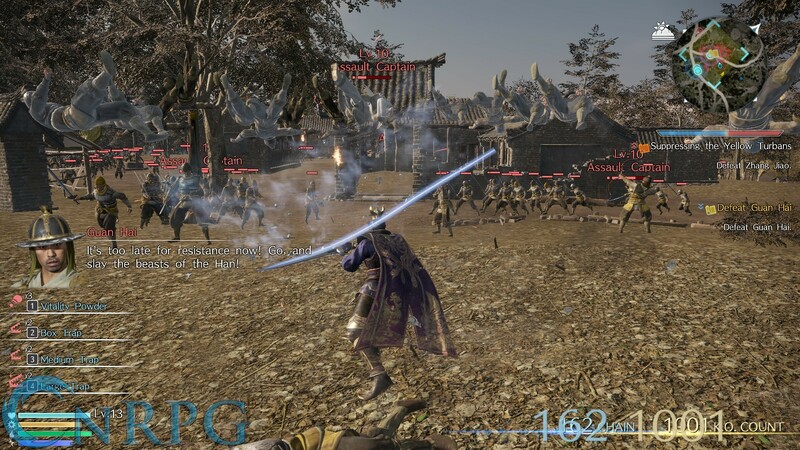 Movement, attacking, and combos are some of the main features covered, as well as the aspects that differ from previous installments – namely the map features. 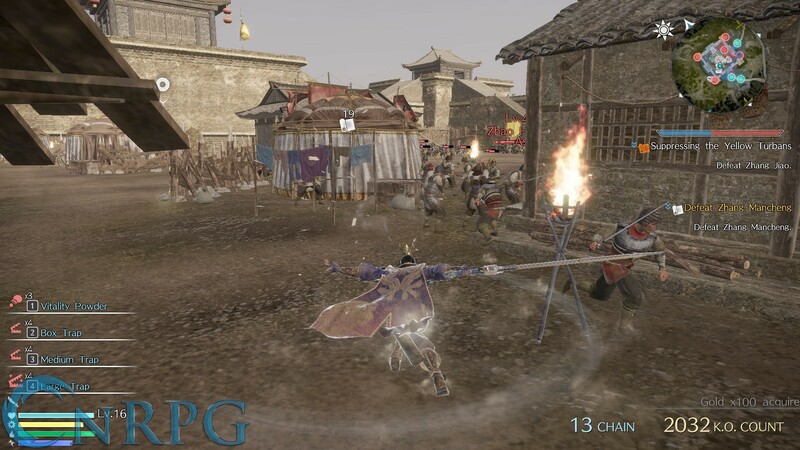 Unlike previous games, Dynasty Warriors 9 is not broken up into stages, but is an open world experience where you can freely roam ancient China. Control-wise, the game feels nice. 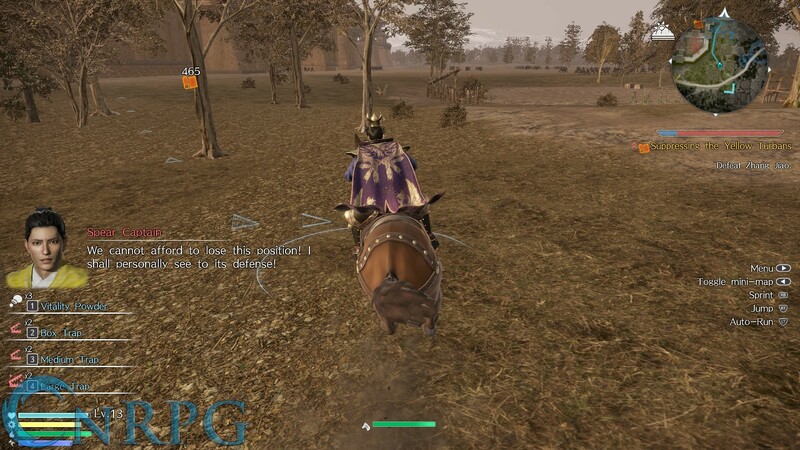 There does seem to be a bit of unresponsiveness in certain actions (sheathing/unsheathing weapons and calling for your horse come to mind), but overall everything responds as it should. If you’re on the PC, however, you may be in for a bit of a challenge. The keyboard controls just aren’t good for a game of this nature, and actually getting a controller to work for the title is an exercise in-and-of itself. You will need an XBox One or PS4 compatible controller, and even then, some controls still seem to not be recognized by the game. 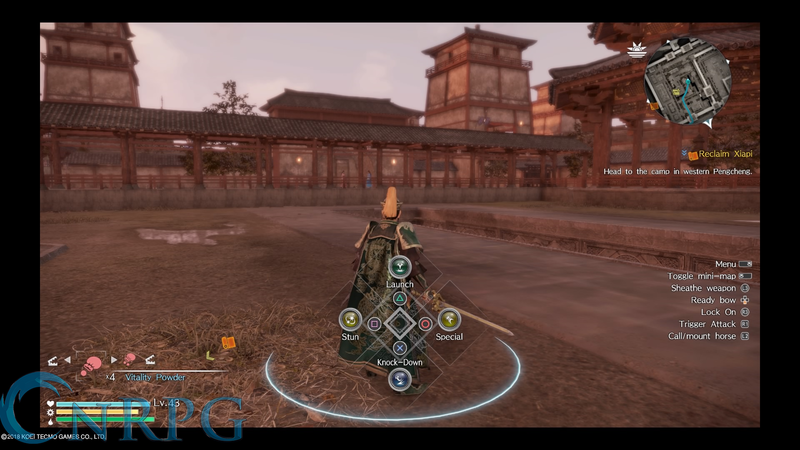 Besides being an open world experience, Dynasty Warriors 9 changes one other mechanic quite significantly: combat. In previous titles, one button would be used for basic attacks, another for power attacks. Power attacks changed depending where on the normal attack string you used them. Well, that is now gone, replaced with what’s called Flow attacks. 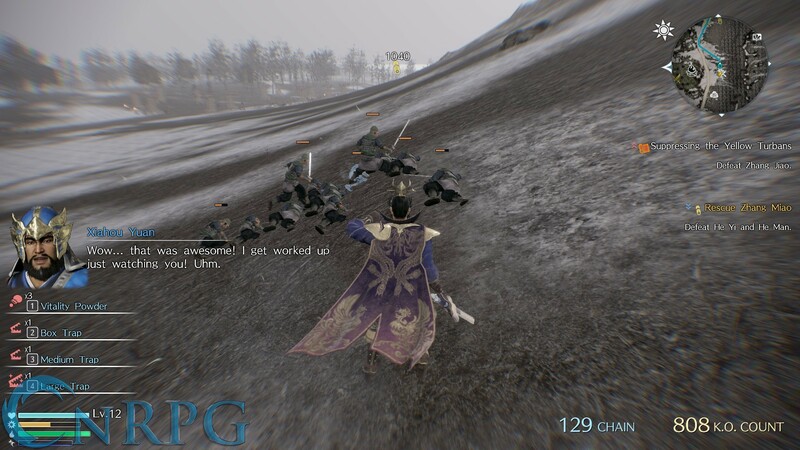 Depending on what actions you take, your character’s attacks change to match. 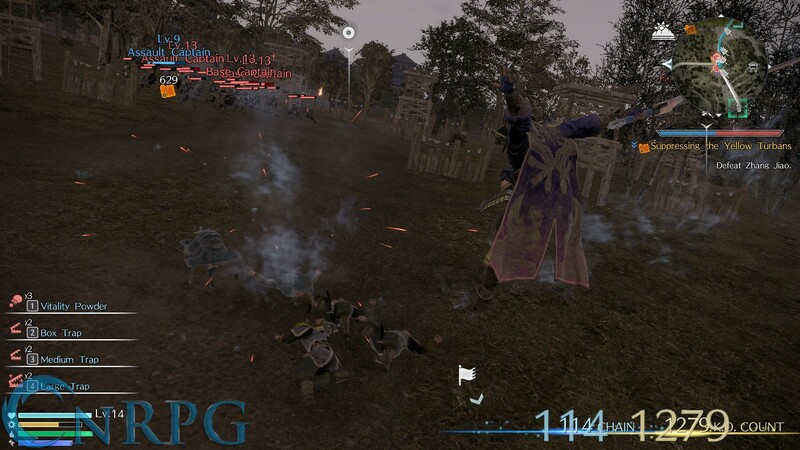 For example, basic attacks differ on an opponent that’s standing, knocked down, or launched into the air. Players facilitate the change of these attacks utilizing special attacks bound by default to the right bumper. These attacks can all be chained into some impressive combinations, especially when used with the new power attack, which functions as a guard break (in most cases). In addition to these attacks is a special attack, unique to every character. 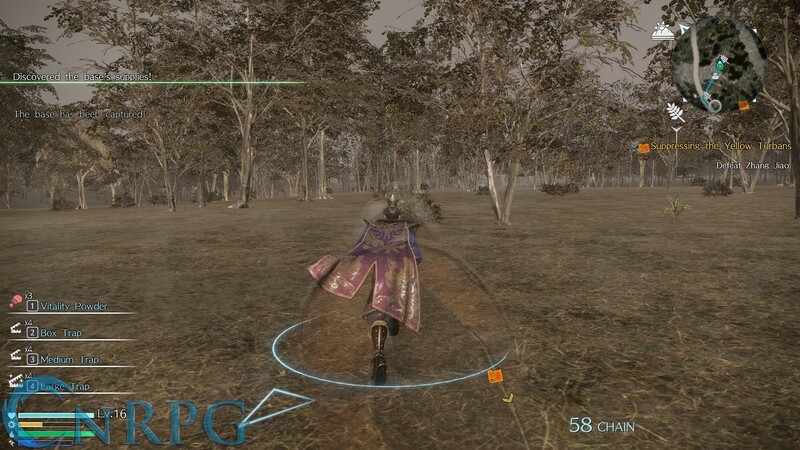 These attacks are usually very powerful, and have the character’s element attached to it. They need a recharge before using again – basically attacking without being hit by enemies and chaining will build it back in no time. 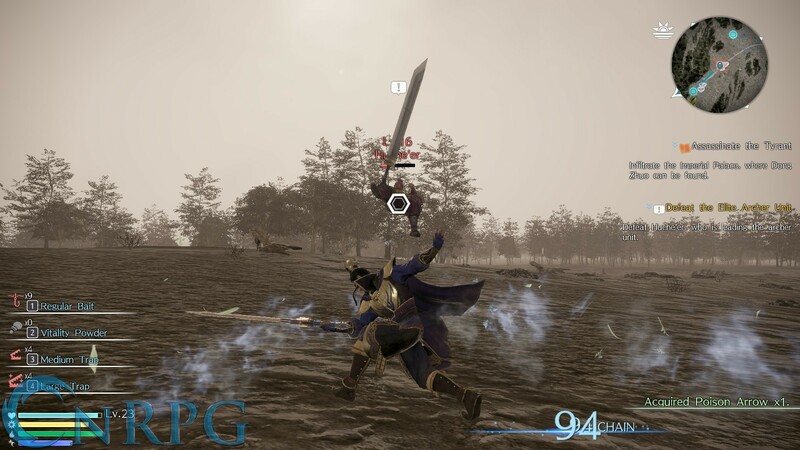 Also unique to every character is their musou attack, which provides huge damage at the cost of needing to build it back up from nothing every time. 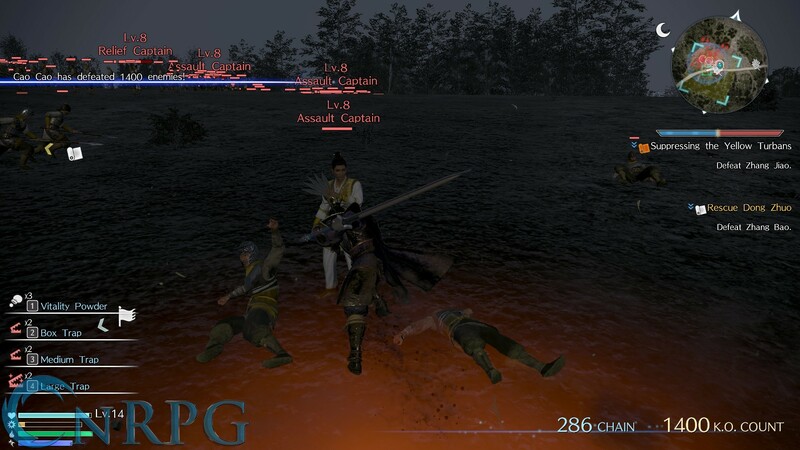 Players can also use jumps and dodges, and everyone’s equipped with a bow, which can be useful for a variety of scenarios. Shocking no one, maps show you where to go. 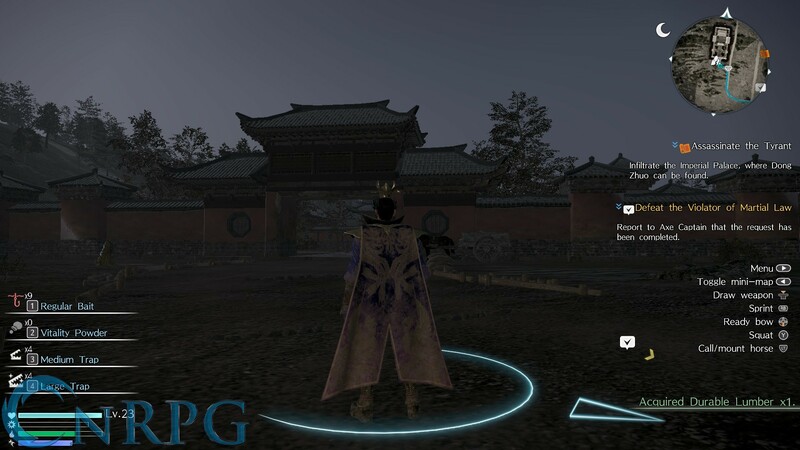 Dynasty Warrior 9’s map does that function and much more. 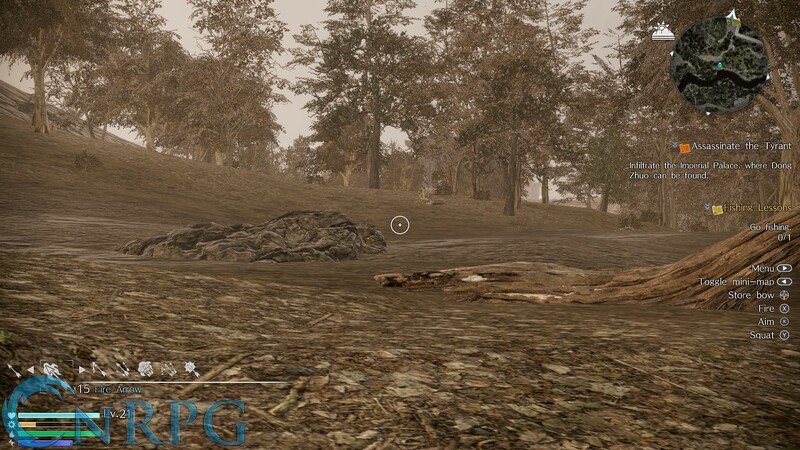 Being an open world game, there is a ton to see. Cities dot the landscape and campsites litter the wilderness. 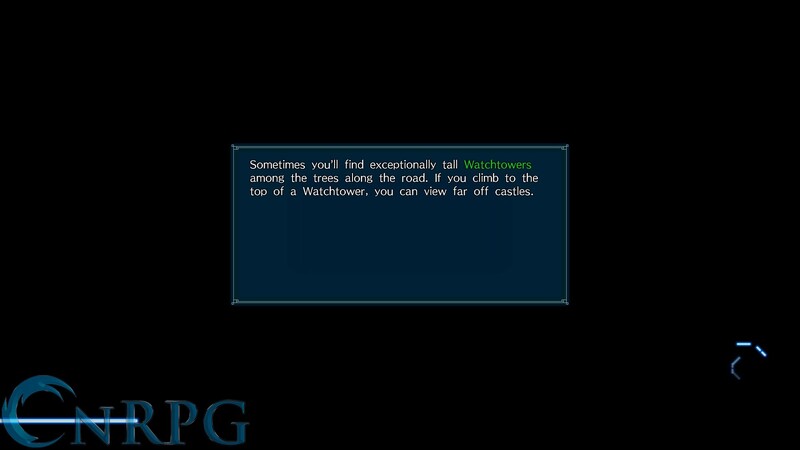 Watchtowers pepper the land as well, giving you a detailed look around their area. There are sights to see all over the place, mountains to climb, and plenty to discover. You’ll be spending plenty of time on the map screen as you play. In addition to showing the land, the map gives plenty of other information such as the spheres of influence for your allies and enemies. The larger and brighter the area, the more control over that spot the forces have. It’s handy to glance at to see what you might be rushing your character into at any given time. 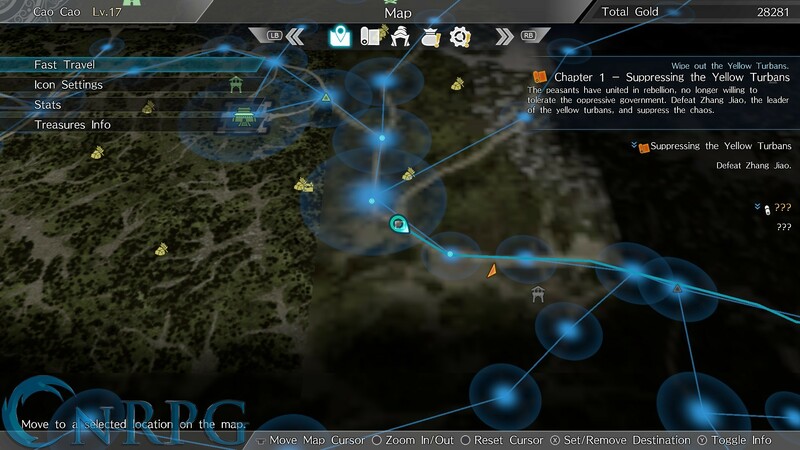 The map also displays the location of nearby clusters of items and rare treasures. I’ll touch on why that’s important to know later, but needless to say, it’s fun seeing the sheer amount of things on the map. 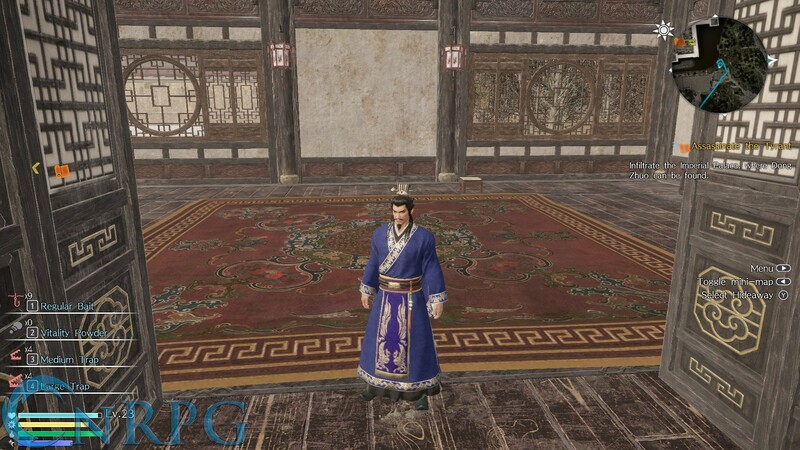 Every character in Dynasty Warriors 9 can be outfitted with a variety of gear. While you can equip any weapon to any character, each one has a preferred weapon, and their special attacks will only work with that weapon. 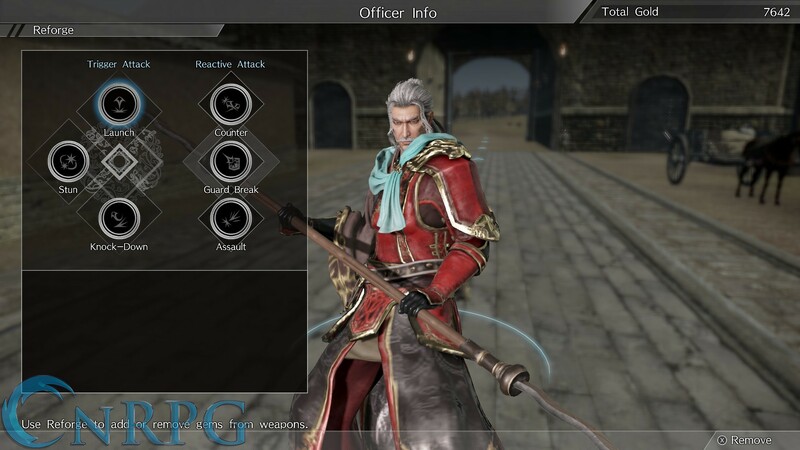 In addition, character weapons can be further enhanced with gems, which provide a variety of effects such as stat boosts and elements such as lightning, fire, ice, and more. Gems are integral to making your characters more powerful, so it’s important to match the gem to the style you’re going for. Four accessories are also available, which have a range of options from simply increasing attack to the more exotic such as drawing all dropped items to you. 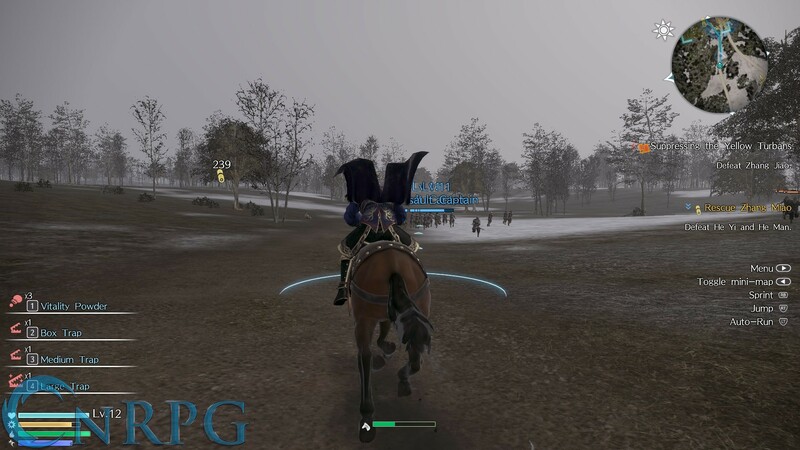 After you progress in the story, you can purchase a different horse and equip that, too. 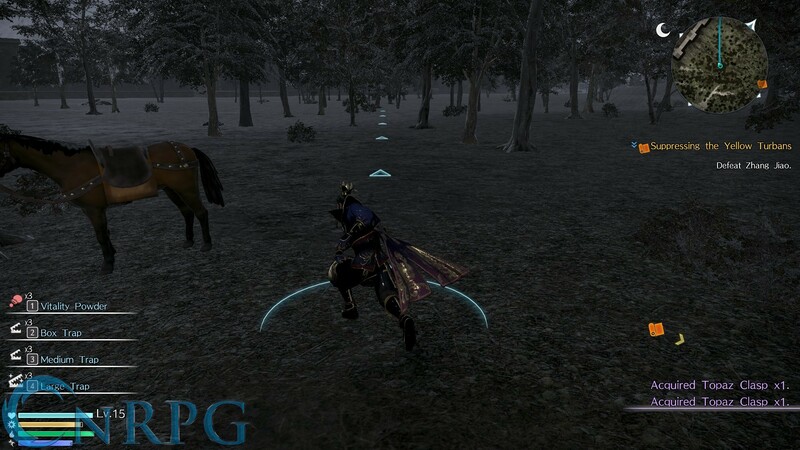 Horses level up as you use them, increasing their speed, endurance, and knockback ability. 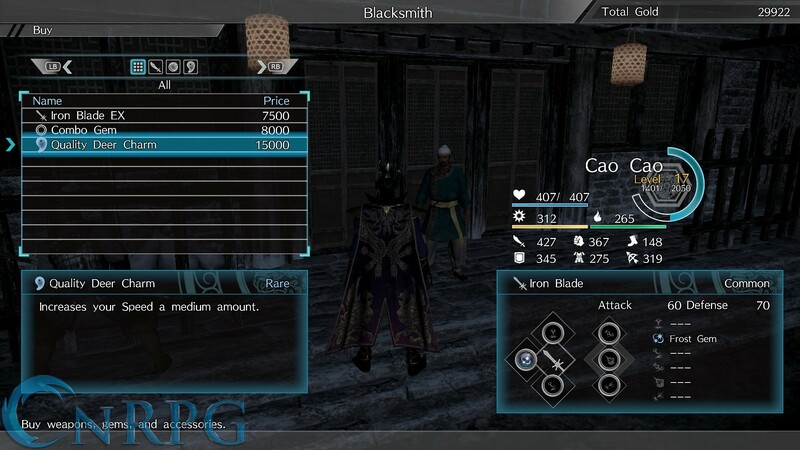 Finally, you have four slots for consumable items, for emergency healing or musou recovery while out in the field. In addition to equipment progression, as you play, your character levels up. Each level gives you three stat points to distribute, which better allows you to develop each character to your liking. 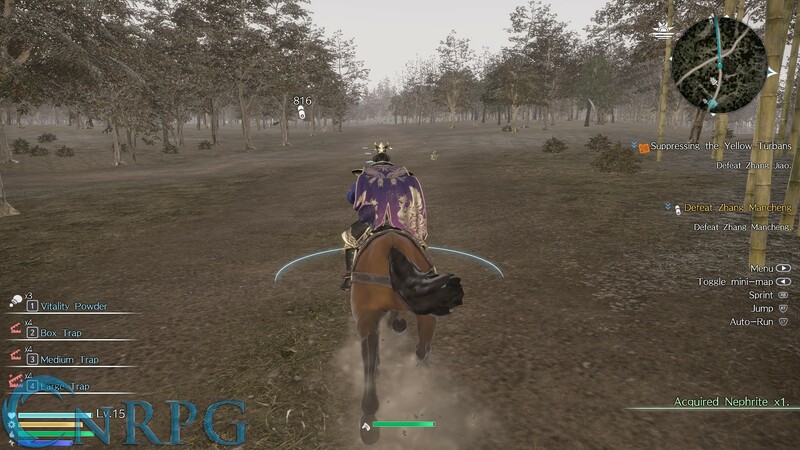 Wanting a character that zooms across the battlefield with little need for a horse? Build their speed! A god of war that mows down enemies and doesn’t flinch from their attacks? Attack and defense are your friend! You can go the balanced approach too, and develop all of the stats equally to make sure you’re prepared for anything. 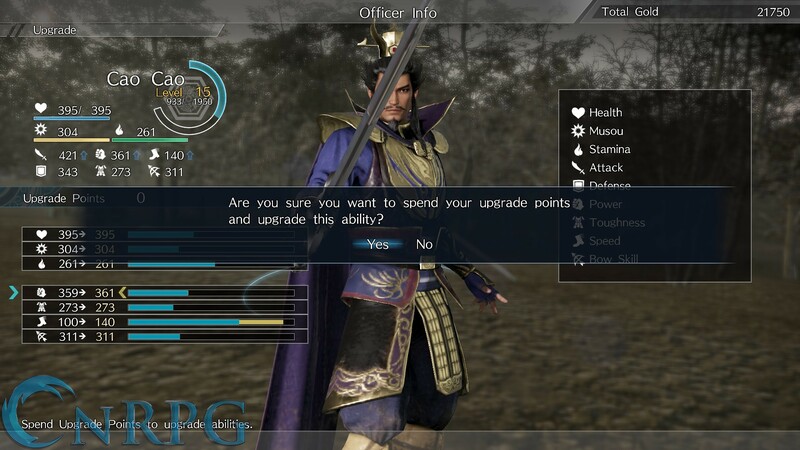 One new feature to Dynasty Warriors 9 versus the previous games in the series is the addition of crafting. The feature is simple enough to understand: have the materials, craft the item, right? 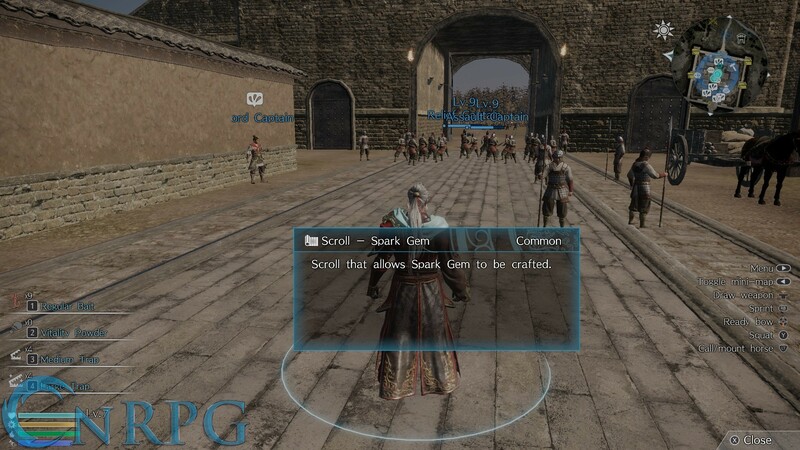 Well, DW9 first requires you to have a complete set of scrolls for the items first; some items require up to three of the same scroll before you can begin. Thankfully, once you’ve gained all of said scrolls, you can craft with impunity. Weapons, accessories, gems, and consumables can all be crafted, and crafting is the source for a lot of the items you’ll need. Spread all throughout the world are the raw materials you’ll need for crafting: plants, wood, ore, and gemstones. Worried about needing to grind severely? Clusters of every item appear on the map somewhere, and have a generous respawn rate to allow you quickly gather up what you need. Of course, only some items can be crafted wherever you want. Consumables generally can be made on the fly, but for things like gems or weapons, you’re going to need to find a settlement with a blacksmith. Also keep in mind, some scrolls are purchased through alternate means such as collectibles or hunting trophies (more on the latter in a bit), so you’ll likely need to do a bit of searching to find everything. 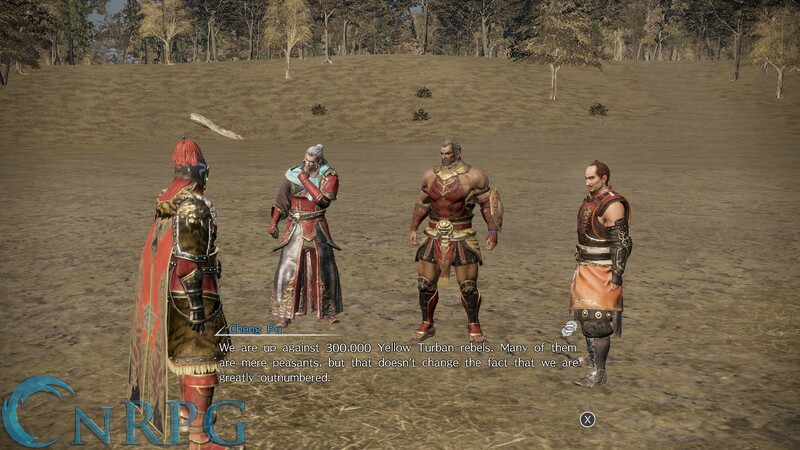 Trying to explain the story progression system in Dynasty Warriors 9 can easily get mired in similar verbiage. The main story progresses in chapters. Each kingdom has several chapters of progression. 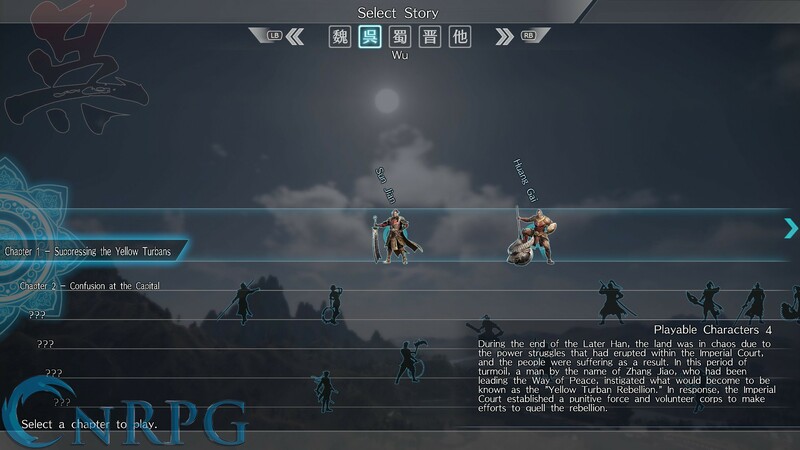 Each chapter can have one or more main quests to complete. These quests can range from defeating a boss to fleeing for your life without you or your allies being defeated. The main quests also tend to have the best rewards, of course; most commonly they grant either gems or full scrolls. 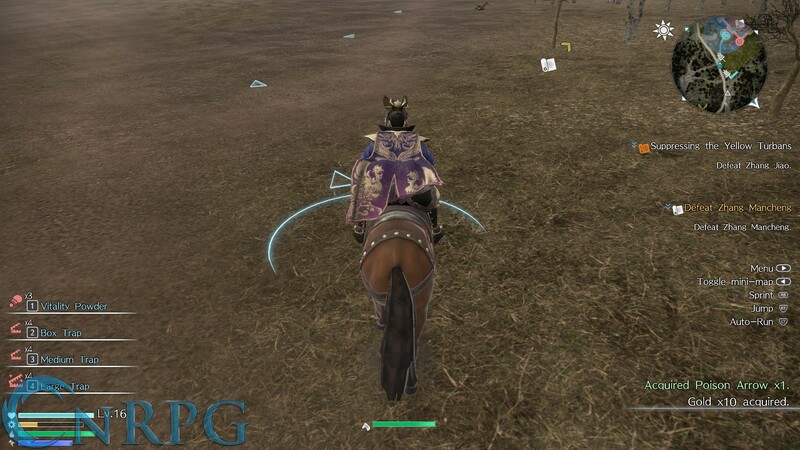 Each main quest can also have several side quests attached to them, the completion of which can help you complete the main questline by lowering its difficulty level. Of course, things get further muddied by the fact these side missions can also have side missions attached to them, which help lower the difficulty of said main side missions! 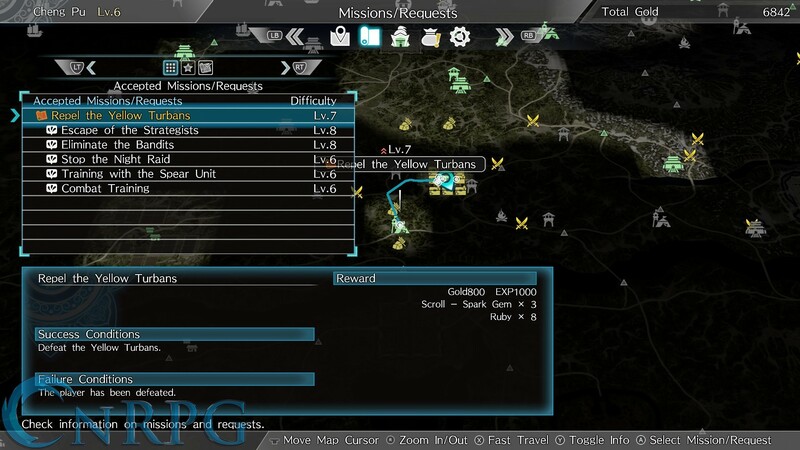 Capturing main bases across the map also lowers the difficulty of the side missions nearby. You’re also free to just rush in and beat the main quest of the chapter at any time, though you lose out on the additional rewards. 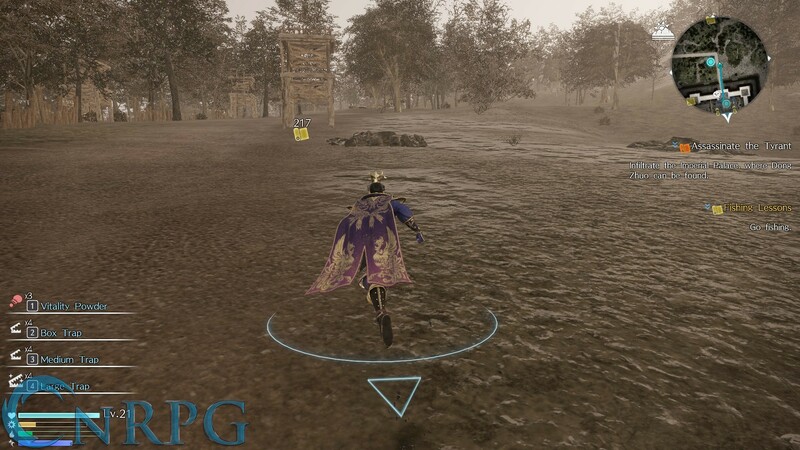 Let’s also not forget there are additional, optional quests available at bases you control, that while not story important, do provide your character more experience, gold, and sometimes gathered items. Let’s face it: ancient China’s a large place. Thankfully, there’s plenty to see and do as you’re traveling across the lands looking for foes to smite. There are tons of landmarks to see and discover, each with its own challenge to find. For example, early on you’re tasked with climbing Mount Song, utilizing your grappling hook to rise. There are a couple of cleverly hidden treasure chests along the way, too. The view from the top of the peak is absolutely amazing, and definitely worth experiencing, in my opinion. With such a large world, it’d be difficult to get back and forth across the map with any form of haste. Fear not, however, as there is a robust fast travel system available. It’s also not limited to major locations either. You discover waymarks as you go along, and each of those can be returned to. There are also watchtowers where you can get a nice view of the surroundings you can return to at will. Small villages, large settlements, forts, and walled cities all await your discovery. 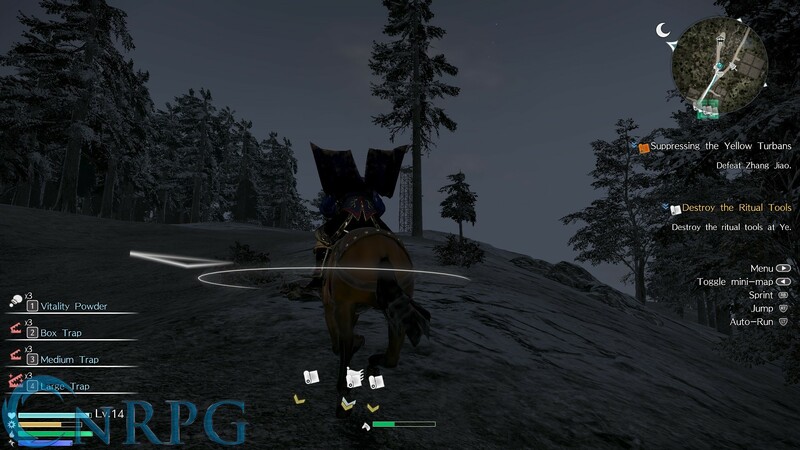 Or you can wander the wilderness collecting ingredients, and hunt a large number of animals such as deer, wolves, bears, and even tigers. In fact, the more you hunt, the more points you accumulate, and you can spend those points on some pretty good items back in towns. 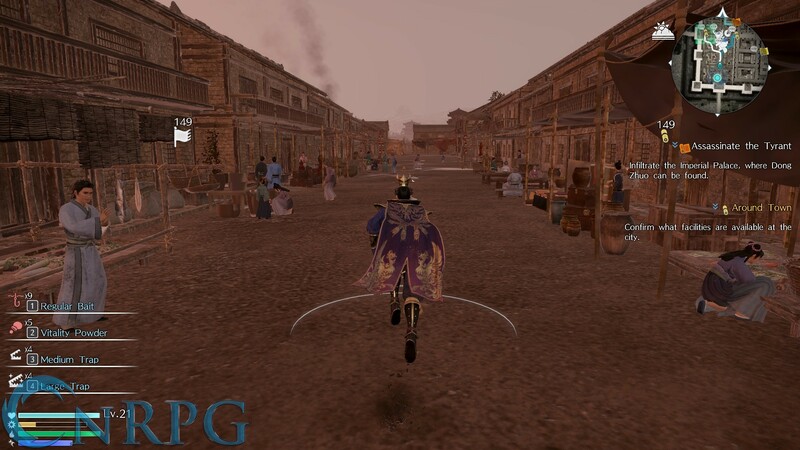 Dynasty Warriors 9 also grants a large number of Hideaways to purchase. These hideaways are akin to player housing, and if you purchase or create furniture, they can be customized to provide a variety of effects. By default, you can use your bed to heal and pass time, a dresser to change into informal clothes (but only in the house, alas), and a stove to cook meals that boost your combat capabilities. Hideaways also allow you to invite allied officers to strengthen your bonds. You will receive gifts from the officers you invite, and they will start visiting on their own if you build their affinity higher. This can be a great way to earn even more resources. Any good general should maintain a rapport with their officers, right? Wait, two scores? What gives? Well, first of all, I really enjoyed Dynasty Warriors 9. It’s not perfect, of course. The AI is laughable – watching your allies crowd around you while you do all the work can be amusing. The English voice acting is campy on a good day. There’s some odd glitches here and there, which can be expected for a game of this magnitude. So why the low score for PC versus the console versions? The controls. 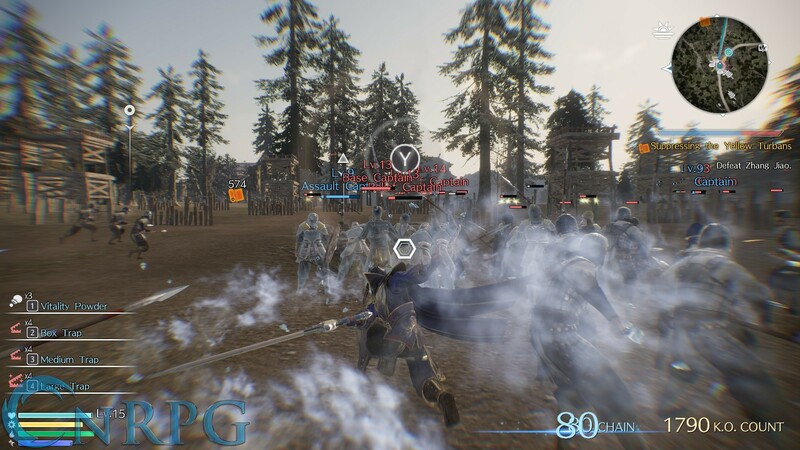 The game just is not designed with mouse and keyboard players in mind, which would be fine if it weren’t for the controller issues I touched on earlier. There is also some significant framerate issues I’ve noticed, even playing on lower settings. These issues absolutely mar what would otherwise be a good PC port. The console versions? They’re just fine. Just keep in mind this is a departure from previous Dynasty Warriors titles in several ways. 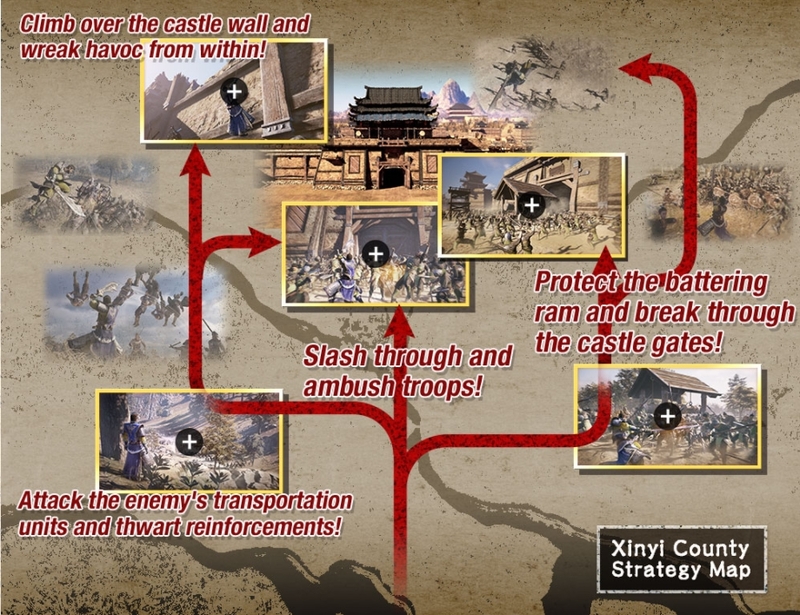 As our editor-in-chief puts it, “some of us wanted to feel more connected to the actual history, scope, and scale of Romance of the Three Kingdoms.” It definitely provides that experience in spades. Fans of the older styles, who played the game for the intense mashing action may find themselves displeased by this decision (and many are). If you’ve played previous installments, and enjoyed the Empires expansions more than the regular game, though? 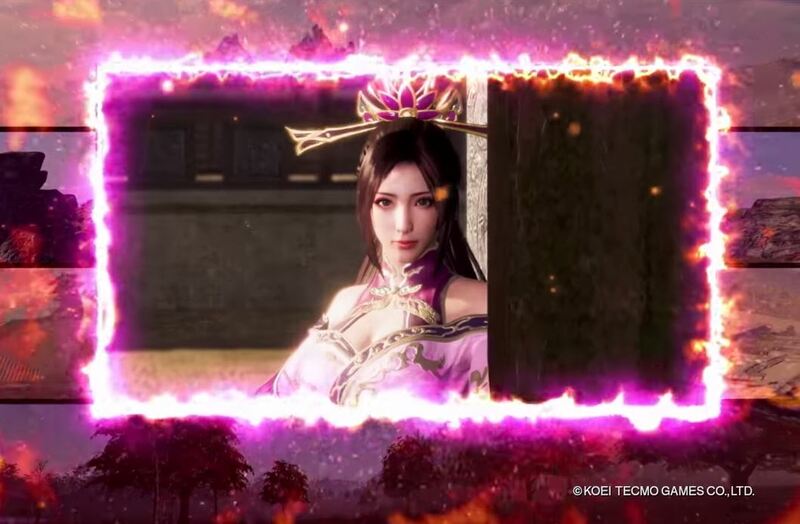 Dynasty Warriors 9 is right up your alley. I love the change – and believe it to be the best game of the series now.